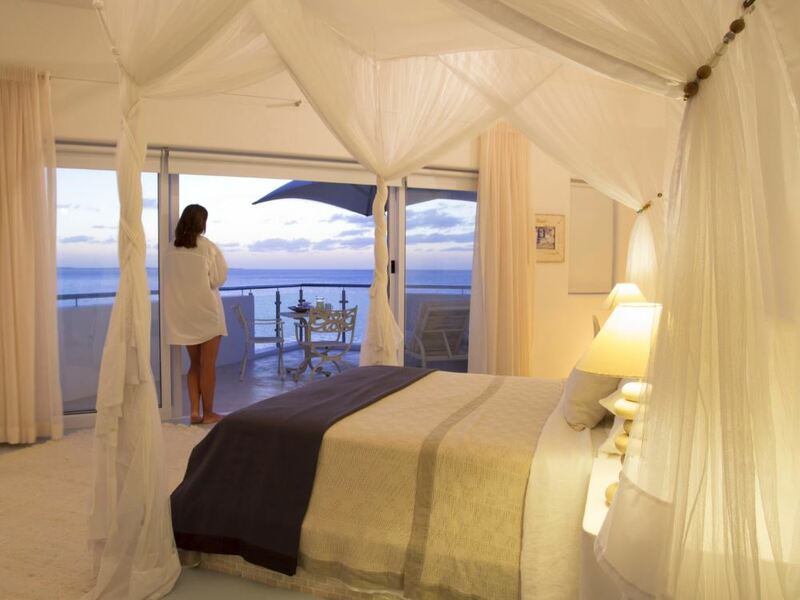 The Chapel is a fantastically romantic retreat for two, perfect for a honeymoon couple with its very private deck complete with pool, outdoor shower and stunning ocean views - you may disappear into this retreat, only to re-emerge at the end of your stay! the Santorini villas are a wonderfully upmarket option, particularly for a family group or friends looking for an exclusive and luxurious holiday away from the crowds! A short drive outside the dusty streets of Vilanculos lies one of the most stylish properties in Mozambique – the gorgeous Santorini villas! The name obviously gives a large hint as to the styling of the villas which, uniquely for this neck of the woods, have a strongly Greek island influence, both in terms of the colour palette (blindingly white washed walls combining with light blue accents) as well as the architectural lines themselves. It might sound as though it could look a bit out of place but in reality it works superbly well on this sun-kissed stretch of coast and the Santorini villas are a wonderfully upmarket option, particularly for a family group or friends looking for an exclusive and luxurious holiday away from the crowds! Similar to Bahia Mar which lies a little further south, Santorini enjoys spectacular views out over the aquamarine waters and scattered islands of the Bazaruto archipelago – and forms a great base which you can simply chill at and relax or use as a springboard to explore the treasures of the archipelago. 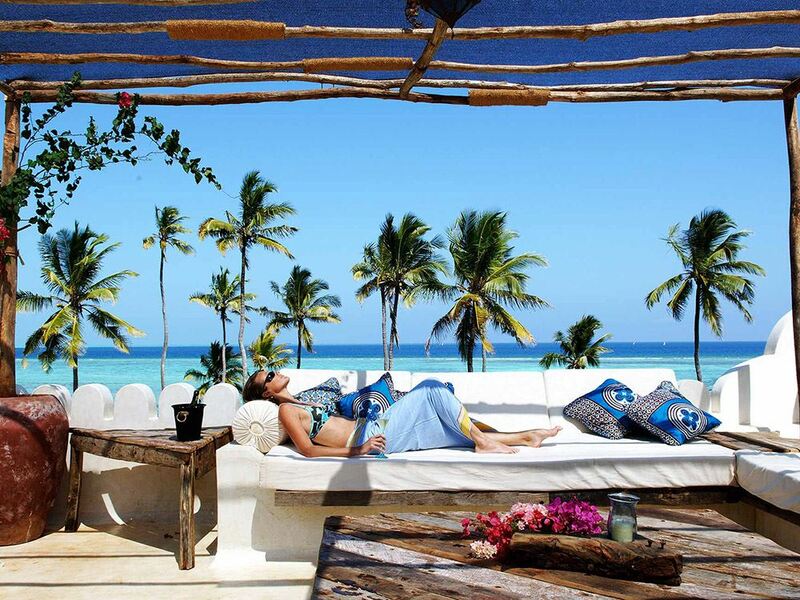 Here you can explore, island hop, snorkel, laze in the warm Indian ocean or around the courtyard pool dreaming of dinner, prepared by your personal chef. Listen to the tinkle of ice, perched on the lip of the martini pool or to the slap of waves against fishing dhows while being massaged on the viewing deck. The choices are endless. The main villa consists of 5 sea-fronting, air-conditioned, en-suite bedrooms, each with private balconies and accommodating 10 adults or alternatively 8 adults and 6 children. The living area is gorgeous and provides you with a wealth of places to put up your feet and chill – there’s a lounge, TV room and library, ocean facing deck with martini pool, secluded patios, wind-protected courtyard with a gorgeous pool, 24-hour guest beverage-kitchen and a range of communal and intimate dining spaces, providing guests with a wide range of private living, relaxation and dining options. 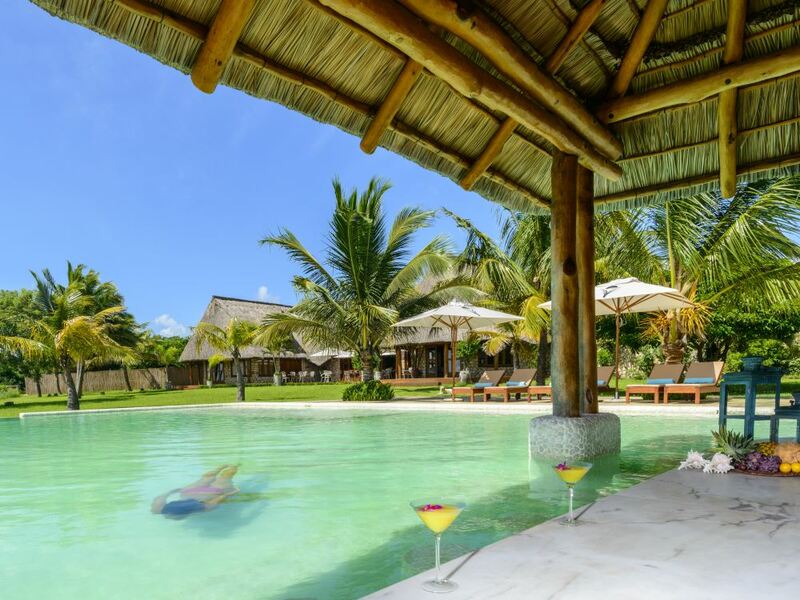 The villa has two kitchens – one where outstanding meals are prepared by the resident Mozambican chefs, whilst the other is purely for guest use should they wish to help themselves to an ice-cold beverage, a cappuccino or perhaps a glass of wine of their choice. However, friendly and personal waiter service is always available. The Chapel at Santorini is just a short walk away from the main villa but provides exquisite privacy suitable for honeymooners (or any couple simply wanting the most romantic and private retreat around!) – once you close the gorgeous old wooden doors behind you, you enter a lovely open plan lounge area leading out onto a spacious deck boasting a private plunge pool, sensuous outside shower as well as sensational views out over the ocean! Then there’s Villa da Paraia - perfect for exclusive rental by a family or small group of friends with its 3 en-suite bedrooms, private infinity plunge pool and butler service. Santorini’s in-house management and staff are on hand to attend to any requirements. Tantalizing daily menus are on offer and special dietary requirements accommodated. The magic created in the Santorini kitchen is enchanting. Food is sensual and it is the intricate colours, flavours and aromas that entice the taste buds. 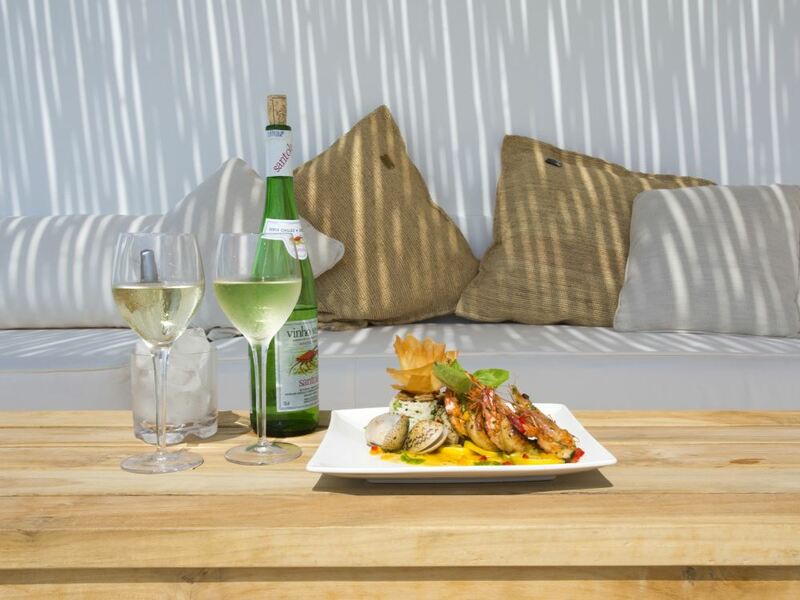 At Santorini, local chefs produce this magic variety of tantalizing tastes throughout your stay. With a choice of up to 4 courses per meal, it’s a sensory experience to treasure. We stayed in the main villa, where you can dine in the courtyard while listening to the water trickle through the overflow pebbles, or by the martini pool while watching the magnificent colours of the moon rising over the ocean. The shaded pool courtyard with its al fresco seating area beside a pizza oven and gas BBQ is a wonderful place to enjoy lunch before flopping back into the pool to cool off. The ocean front deck has a pale blue martini pool which faces directly onto the sea. Relax, meditate, entertain on the covered sala, upstairs from the courtyard. Tucked below this is another deck for private massages or romantic dinners. This part of the Indian Ocean is best known for its sandy-white beaches and some of the best scuba-diving in the world. If scuba diving is not for you, explore a whole new world by snorkelling in clear waters where you are likely to come across whale sharks, giant lobsters, humpback whales, turtles, dolphins, manta rays and game fish. Santorini will arrange these activities for you so you can experience the best that the Bazaruto archipelago has to offer. Other activities include kayaking, stand up paddle boards, sand boards and more. There is always something happening or something to do here – or you can choose to do nothing at all and simply let the easy pace melt away any stress and tension remaining from the city. Either way, Santorini provides an unforgettable, once in a lifetime trip you’ll never want to end.